If you’re after a versatile shoe for every occasion, Chelsea boots are the way to go. These ankle boots are stylish, yet easy to pair up with your everyday outfits, making them the perfect transitional piece for day to night looks. Whether you want to look dapper at the office or simply want to introduce different elements to your everyday outfits, these shoes are the way to go. Not sure what to wear with Chelsea boots? No worries, we’ve got you covered! Take some inspiration with our style guide for every event and you’ll be good to go in no time. Chelsea boots add a hint of timeless style to a relaxed casual outfit. Give your go-to outfits an upgrade in an instant by swapping trainers for these classic ankle boots. A scarf is an incredibly easy way of transforming any simple look and make great focal pieces, especially if you find yourself reaching for plain tees. Choose one in a contrasting colour to your top to really turn heads. Go for ripped jeans if you’re feeling brave, otherwise grab a pair in your favourite fit. Not sure what to go for? The premium Replay Jeans are crafted from a comfortable cotton blend so you’re guaranteed to feel as good as you look. It can seem tricky to know what to wear with Chelsea boots when it comes to outerwear, but there are actually plenty of options. Try a traditional peacoat for a smarter vibe but the ever-popular bomber jacket is another on-trend option that’ll keep you looking good no matter the weather. Rob’s Top Tips: Bold prints and bright colours should be a go-to when it comes to accessories, so let the scarf do the talking and don’t be afraid to catch attention by going vibrant. Heading to a wedding or celebrating a win with your colleagues? Chelsea boots exude class, making them perfect for the times you have to dress to impress. Go for classic black boots if you’re choosing a grey suit, otherwise, switch it up with a chestnut pair. Pair your boots with a refined matching blazer and trouser combo in a flattering tapered fit for the ultimate gentleman’s outfit. It may be tempting to reach for a shirt but dare to be different in an on-trend turtleneck in a block colour such as grey, black or white. The Classic Merino Roll Sweater by Fred Perry is an ideal example thanks to its sleek ribbed detailing and comfortable feel. Rob’s Tips: Layering is key for any formal event, especially when the weather starts to turn. Try layering a sweater over your turtleneck to keep the cold out while remaining dapper. Explore the great outdoors in an outfit that exudes that ‘country gent’ look. Whether you’re seeing the sights in a new city or going for a walk in the countryside, you won’t look out of place in a Powell Jacket from Barbour. Its contemporary quilted exterior and warm fleece lining keep you warm without having to sacrifice style. Brown Chelsea boots go incredibly well with beige and cream coloured trousers due to the contrast in colour. Opt for a tapered or slim fit to modernise the traditional elements of the look, while staying true to the tone. The classic layering of jumpers and check shirts should never be overlooked. Not only does it pull the entire look together, but the pattern on the shirt also adds a dash of stylish character that’s perfect for a trip outside. Rob’s Top Tip: Roll up the cuffs of your trousers to show off your boots and add some flair to the traditional outfit. 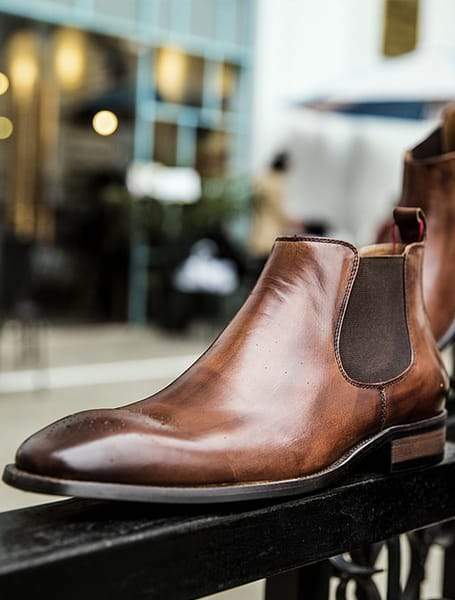 Show off your style around the office with some versatile Chelsea boots from R.M Williams. Durable yet sleek, they were made to last without looking brash or bulky but rather dashing and gentlemanly. Follow the dress code with a comfortable pair of chinos or up the edge factor with check print trousers. Whatever you go for, choose a fitted pair to pull off a more polished finish that shows off your build rather than swamping it. A white Oxford shirt is a wardrobe essential for any man looking to make a lasting impression. The classic fit is sure to compliment any body type but look for a fitted version if you want to extenuate your biceps. Keep those important documents safe when heading to a meeting with a sophisticated holdall. Choose one in black to match your shoes for a simple yet effective pairing. Rob’s Tips: Opt for a patterned tie to add some character to the look if you choose plain chinos. Heading to the pub with your friends? Try something different than your typical trainers and whip out the Chelsea boots once more. Forget suede and stick with a black leather version to avoid potential damage from spilt drinks. Don’t overthink what to wear with Chelsea boots and stick with a simple base such as straight leg jeans. Not only do they suit practically everyone, but they’re also effortless and easy to pair up with almost any top. In this case, try out a classic white polo that exudes that timeless and luxurious feel. Finish off the outfit with a trendy bomber jacket and you’ll be good to go. Don’t let the weather ruin your confidence by opting for a weather resistant option such as the Replay Padded Bomber Jacket. Rob’s Tips: Straight leg jeans look great with a tailored polo thanks to the contrast in fit. Why not take this a step further by pairing a white polo with black jeans? The monochrome look is flattering for all builds. 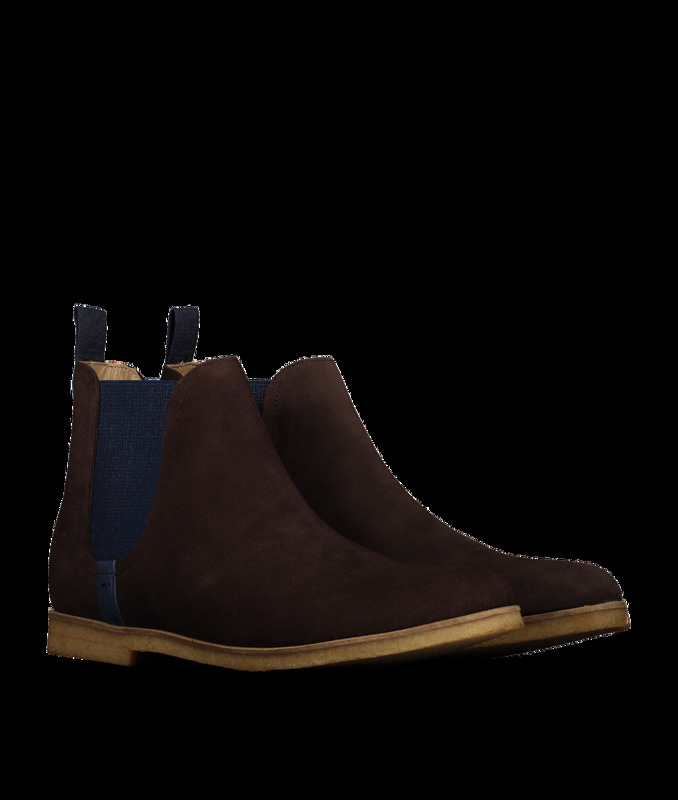 Now that you know what to wear with Chelsea boots, why not browse the Rob’s selection of boots? We stock a range of luxurious yet wearable Chelsea boots that you’re sure to love.